Welcome to the Digital Edition of the August 2016 issue. Newsmaker – From the moment Deirdre Latour rose to the top comms spot, GE’s new CCO has directed a daunting global task list — from a multibillion-dollar acquisition to the controversial relocation of the company’s headquarters — with the poise, panache, and leadership of a seasoned pro. 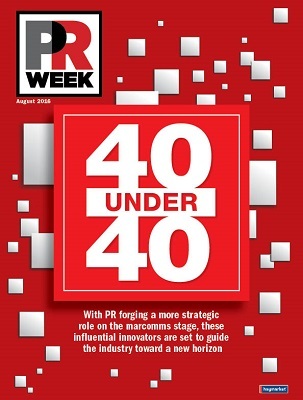 40 Under 40 – With PR forging a bigger and more strategic role on the marcomms stage, these innovators in creativity and influence are ideally positioned to guide the industry toward a new horizon. CEO Q&A – Fathom Events’ John Rubey on the future of interactive cinema and how the brand engages moviegoers. CMO Q&A – Pat Shores of Bark & Co. unveils the steps the company is taking to create a brand that is "Disney for dogs". JQ&A – Kelly McEvers, co-host of All Things Considered and host of Embedded, opens up about the origins of NPR’s most recent hit program and transitioning from short-form news to long-form documentary reporting. We hope you enjoy this digital edition. Download the Digital Edition today.